Second year blues? Maybe not if he gets some extra midfield time. Firstly let me preface this write-up by saying I am a little bit biased towards Mills (I am not completely fan boy obsessed like Roy is with Rocky though!) after the young fellow was part of a three leg multi paying $301/1 collect I had last year (JJK for Coleman, Danger for Brownlow and Mills for RS). It took him until round 16 to get nominated mind you so I was starting to get a little nervous – although from about round 5 even Gerard Whateley from AFL 360 was spruiking how good Mills was and he should be the Rising Star. Mills had an outstanding debut year playing mainly off half back. Most noticeable was his composure with ball in hand and his willingness to go back with the flight or stand under the high ball. He proved to be very durable playing in 20 home and away games before a leg injury saw him miss a few games at the end of the year. The trading of Tom Mitchell opens up some midfield time (although I think Heeney and Lloyd are ahead of him here) but more relevant to Mills will be the Swans succession planning off half back. J McVeigh has been an amazing player for a long time but the Swans need to find a new general off half back. Mills and Rampe are the two most likely candidates (and maybe with the way footy is played these days they will share the loose man role?) and I can see the Swans setting up with one loose behind the ball a lot in 2017. Will he be a top 6 defender by years end? In all honesty probably not and that is the biggest reason at his price I will likely pass on him. He shares the round 11 bye with proven defensive scorers in Docherty, Simpson, Montagna, Boyd, JJ and Vince who all averaged over 90 last year and are all more likely to be a top 6 defender in my opinion. He only scored one hundred over the whole year (and that was against North Melbourne in the final regular season game) which is a concern. If he isn’t given the license to roam free and is continued to be given lock down jobs every week then he will struggle to get to my even modest prediction of an 85 average. Does he offer more value than Warnie’s boy Michael Hibberd (averages of 80, 89 and 87 over his last 3 years) who is priced $13,000 cheaper? Probably not in my opinion – and I refuse to get caught in the trap of starting with too many mid-pricer’s this year. In 2017 I am guns and rooks with no more than 1 mid pricer in any line and I have Hibbo ahead of Mills (and they share the round 11 bye). 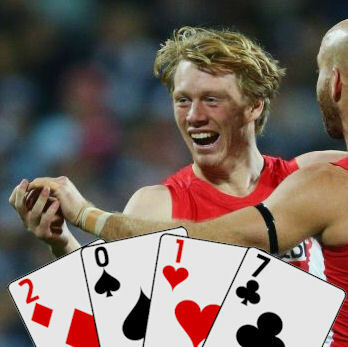 Queen –Learn the lessons of recent years from the likes of Jack Steele, Josh Caddy and even Tom Sheridan – the mid pricer that becomes a keeper is incredibly hard to pick and starting with too many in your initial squad usually limits both your points and cash generation. Whilst I am confident of Mills improving on his 2016 debut season and have been listening intently to the stories of Mills getting more mid field time (along with Heeney and Lloyd), I am not convinced I will be starting with Mills unless he shows a hell of a lot in the JLT. Too many other defenders in front of him this year – however don’t be surprised if he becomes one of our premium options down back in the next few years. What does Callum Mills average? FOLLOW ME ON TWITTER: @lefty113 for all thing AFL Fantasy (and more). Got something to say about the deck? Use the hashtag… #DeckofDT. Nice write up Lefty and well done on the multi too, but Mills won’t be for me this year. Thanks lefty been waiting for this I had mills in my team for a month but changed to Hibbo for same reasons you mention. That Multi though shiiiiiiiiiiit, good article though Lefty thinking 2018 for Mills but love your work. Second year player, NO THANK’S.